The Florida Conservation Blueprint (Blueprint) is a spatial plan that identifies shared conservation priorities across Florida. The Blueprint was developed by the Peninsular Florida Landscape Conservation Cooperative (PFLCC) and partners, including FWC. The Blueprint supports spatial conservation planning to inform conservation action and investment. The Blueprint supports conservation planning to inform actions and provides planners and managers across organizations the opportunity to align their efforts to protect fish and wildlife habitat, improve quality of life for people and develop strong economies. The Blueprint will include additional assessments of future land use change, including sea level rise and urban growth projections, to assist in shaping a more resilient landscape and a sustainable future for natural resources in Florida. The Blueprint will continue to be refined in the future as new and improved data become available. 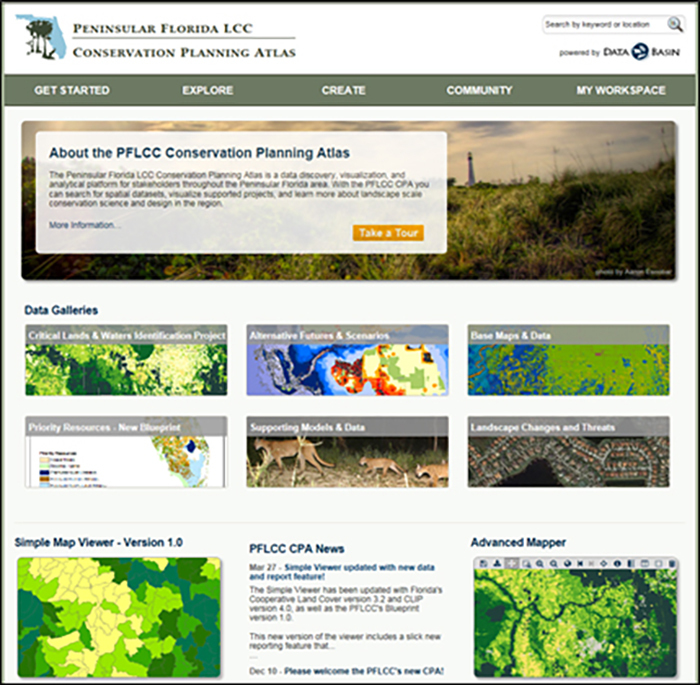 The Blueprint and associated data layers can be found on the PFLCC Conservation Planning Atlas (CPA). The CPA is a science-based collaborative platform where conservation planners and managers can go to view, retrieve and perform analyses on spatial information and access associated information to use in addressing specific conservation goals. Additionally, users can upload their own data to their account to be used in conjunction with provided datasets. The CPA has several tools including the Simple Viewer and Advanced Mapper. Two new tools will be launching in late 2018/early 2019, the Conservation Actions Tracker and the Climate Adaptation Explorer.